Panjere is an ancient world huge and full of magic. For over 18,000 years the Dark God Darkheim has stood in his castle and waged a war against the "civilized" lands of the world. Through two great purgings his minions have survived and now continue to grow and expand, fighting and winning lands that where once fully controlled by the Humans and their allies. Darkheim knows that the time of the final Armageddon approaches. Darkheim will avenge the death of his son and he will see that his son's mate, Demon, rules the world. when your soul is quiet. A whisper from a God that turns dreams to nightmares. Panjere has a mythos that explains the creation of the world, describes two previous 'global wars' against the monsters as well as an armageddon that is set about 2000 years in the future. The character's world has been extensively explored in the past. However, this fact has been lost to all but to a few of the oldest elves. The world must now be reexplored and rediscovered (as does old knowledge). The problem is that as the character races are recovering from the last great purging (dark age) so do the monster populations that are scattered about the world. Panjere is the place to be for fame, fortune and hair raising adventure. Ancient magics abound, and ancient ruins litter the landscape. Vast tracks of land are controlled by monsterkind while other areas are populated with the player races. This means that the space between, the no–mans land represents the frontier area, where adventure is possible. I give you a section of Panjere, an area known as Keal, on the continent known as Uta, near the Kanit mountain range. The sections comprising the area are shown below. When downloaded and printed out they represent an area of land that is about 600 miles wide by 800 miles long. 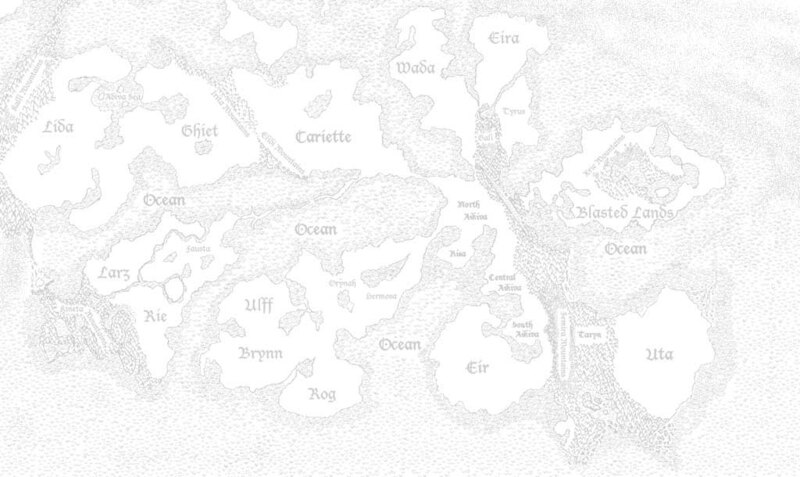 All of the adventures that appear here are set in this area of the world. If you have the correct version of netscape and the PDF reader, then these files should load straight onto your computer screen (at which point you can save them to disk or print them). In the meantime, here are the files. Html Format This document describes the places you are going to find in the Keal area. It lists the cities, towns, inns and the major adventure locations that are present. JPG Format This is a map of the world of Panjere. It is a large world, hand picked by the Gods as a place where their creations could grow and prosper. 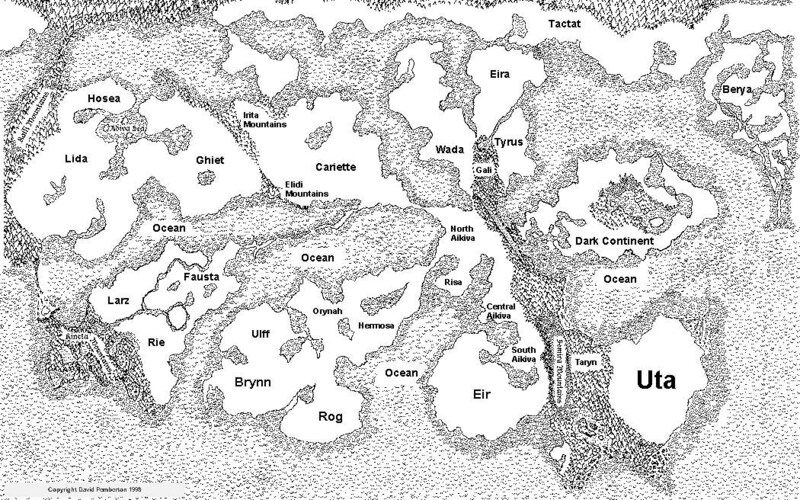 JPG Format This shows you the Uta continent and how the Keal area fits within that area. 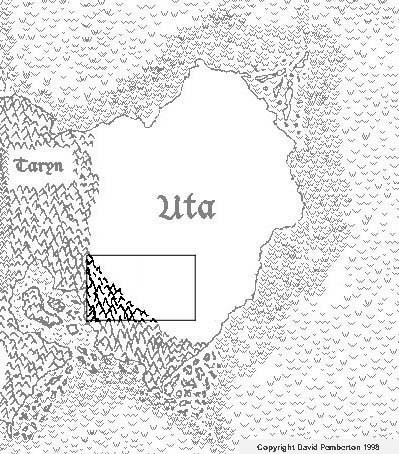 Uta is a large area, nearly as large as North America. Uta is ringed by oceans on three sides and a huge mountain range on the west. The adventure area shown in the box is known as the Keal area (see below). The Keal area encompasses a section of land that is about 600 by 800 miles. GIF Format This Details the Keal area on the Panjere map. It GIF is done at 150 DPI to save space (the pdf file looks much better when printed). The areas on the map are descibed in detail in The Keal Area (description document) found above. Each race in Panjere has its own set of Deities. It is often the legends and myths associated with these deities that supply the cultural identity of the race. What does this mean? It means that you look to the legends of a race to learn why the race is the way it is. But Deity worship is much more than a backdoor description of a particular race. Deities are real in Legend's world. They directly grant spells and abilities to those that follow them. Their artifacts exist and act as the ultimate testimony as to the truth of the stories that tell of the why and how of their existence. At the moment I have 22 Deities done. This is a fraction of the total that will eventually be here, but it does give you something to start with. I have grouped the deities by race and as you can see, some of the races are not yet represented. That will change with time as I think of more to add. In the meantime, I hope that this is enough to wet your whistle and maybe getting you thinking about adding some of your own deities to the set! I have added this section to give dates and time for my most recent updates and additions. It should make it a bit easier for you to see what is new and what has been changed. On April 4, 2001 I added the following four Human Deities. Kalee Pdf Format Kalee is the patron deity of cities. It was his will that saw the rise of the Eternal Wall that even to this day protects Constantine from invasion. But his aid in the cities darkest hour did not come without a warning. "Know you all," he told those within the city. "You will loose my favor when these walls are breached for in their breaching is the end time, the start of the Armageddon." Csilla Pdf Format This is the Human Deity of Paladins. Followers of Csilla hate evil in any form but have a particular hatred for the type of evil that animates and uses the bodies of those that have died. Ulbane and Izzak Pdf Format This is a pair of Human Necromancer Deities. They are presented in a single document since they are very close in nature and are rivals within Panjere. In fact, their rivalry is such that the two deities hate each other and would just as soon see the other wiped out than the world conquered. Amynta ; Pdf Format This is the mother of the Calt race. The legend tells how Amynta prevents Calt souls from being taken to the Dungeon of the Deads (also known as the Lands of the Dead). Nissimee Pdf Format This is the legend of two Calt Deities, Maik the father of the Calt race and Nissimee, the God of Deserts and Travel. Rand Pdf Format This is the legend of Teske and the Calt Ranger Deity Rand. Teske is the first male Calt to ever walk the world. Rand is the Deity that taught him how to hunt and kill an Earth Gorgon so that his future home would be safe for his mate Nissimee. Saber Pdf Format Saber is a Deity of Calt fighters. It was his first and greatest champion that defeated the Titan Vassilij. Veljin Pdf Format Veljin is the Calt's main God of Assassins. Not as dark and evil as many Assassin Gods, he arranged to give aid to the Elvin god Nebela (God of Thieves) in the recovery of the arrows of Melchior (Elf Ranger Diety). It was Veljin's first follower, Farouk that co–founded the Silent Knife Assassins Guild. Melchior Pdf Format Melchoir is the god of Elvin Rangers. It was Melchoir's champion that defeated the monster Ravager and prevented the whole world from being consumed in its corrupting bile. Nebela Pdf Format Nebela is the Elvin Deity of Thieves. Not all that popular in the Elvin culture, she is recognized as helping the Elvin race recover the Arrows of Melchoir (Elvin god of Rangers). Tibor Pdf Format This is the legend of the Elf God of Assassins and of the founding of the Order of Swift Justice. Dionysus Pdf Format Dionysus is the Gnome god of luck and good fortune. He is very popular in the Gnome communities and has lots of followers. Klatou Pdf Format Klatou is the Goblin Death God. His principle shrine is worshiped deep within the Kanite Mountains. His followers wait for the day when the skull of the first wolf will be found and the first follower of Klatou will raise up from death to lead the Goblins to victory over all the lands of Keal. Vaughn Pdf Format Vaughn is the Goblin god of poisons and poisoning. It was he that was gracious enough to bestow the gift of poison upon the world. When the giving of that gift was cut short, it was his first priest Orn that enacted his revenge upon one of the Goblins most hated enemies, the Elf Clelia. Vyvnar Pdf Format Vyvnar is the Goblin Deity of the Four Gorgons. The Four Gorgons are called; The Earth Gorgon, The Water Gorgon, The Air Gorgon and the Fire Gorgon. They are not actually four individual creatures but four types of creatures, each with complete control over its namesake. Vyvnar is a powerful and popular deity within Goblin Culture. Hussar Pdf Format Hussar is a deity worshiped by many Human Fighters. He first showed himself at the battle of Marius pass, in which a small force of humans defended the pass against the advancing army of Drakow (one of Demon's daughters). Kezia Pdf Format Kezia is one of the lesser known Human Ranger Gods. She lights the night sky and gives birth to the animals that populate the wilderness areas of the land. Ashur Pdf Format Ashur was one of the first Deities to identify himself to the Lazinar. As such, he has had more influence on their Culture than any other Deity. Ashur taught the Lazinar of the Combat Circle and of how it was to be used to determine rank and settle disputes within their culture. Kineta Pdf Format Kineta protects the Nagis and was the one to teach them how to live as part of the swamp rather than destroyers of it. Sachi Pdf Format This is the Nagis King of the Spiders Deity. Although he calls himself the King of the Spiders he is a full Deity. He is a very popular Nagis deity because he is seen as a protector and teacher of the Nagis race. Zylle Pdf Format Zylle is the creator of the lands of the dead. He is a deity that believes in pain, agony and knows no mercy. It is included primarily as an NPC deity for reasons that will be fairly obvious when you read the legend. Murtagh Pdf Format Murtagh is the Trocks patron Deity of Combat and Fighters. His Hall of Heroes waits for those that die with honor and courage on the battlefield. Nova Pdf Format Nova is the patron deity of the Trocks. Not only did she create the Race, but she sacrified her freedom as a Deity to save them from themselves. Ryszard Pdf Format Ryszard is the Trocks Patron Deity of Cold and of Winter. It was he that taught the Trocks how to survive the cold. As the characters gain levels they will probably be enticed to join a guild. In Legend, guilds let the character take on the traditional roles found in most fantasy settings. This is where you define a fighter, a ranger, thief or paladin. At the momemnt I only have two guilds done. This will change. On Panjere, there are as many guilds as there are deities, each race has its own set. The Silent Knife Pdf Format This is one of the Calt Assassins/Thief Guilds. Its founding members were a Calt Assassin and an Elf Thief so it is one of the few Guilds tha allow both types of character's as members. Swift Justice Pdf Format This is a very specific Elf Assassins Guild. In order to become a member the character must worship the Elven Deity Tibor. The Guild is dedicated to the protection of the Elven homelands and allows Elves a method to avenge wrongs that are perpetrated against Elves by non Elves.